Introducing the Salomon XR Mission, the forerunner to the Salomon XR Crossmax. 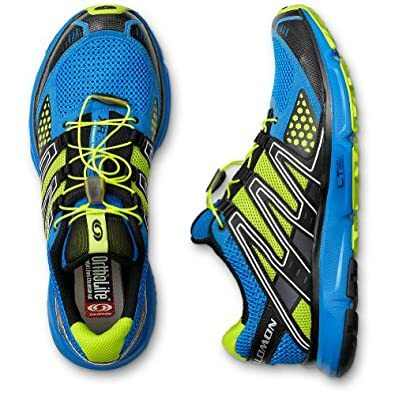 The XR Mission is a hybrid shoe, which means it can be run on both road and trail. You don’t want to make this your only road shoe, but it can be taken on smaller runs on just road. The idea behind the hybrid shoe is door to trail, which means if you don’t live next to a trail these shoes can get to the trail which might be a few road miles away from your house. Notice the black pad, it has 2-4mm of extra cushioning. What makes this shoe able to run on the road is extra cushioning and a special outsole called Contagrip HA (high abrasion) which is a durable outsole that provides traction over varying terrains. It also has Contagrip LT which is a lightweight outsole which provides light durable traction over all sorts of terrains. The traction on this shoe is amazing, it grips on most surfaces and holds on tightly thanks to the staggered traction which faces forward and back. Another amazing feature that this shoe has is the OS Tendon (Oversized Tendon) which is a piece of TPU which is placed over the flex groves on the shoe to give you rebound in your push off. The system also acts like a real tendon by flexing to provide reasonable stretch and balance throughout the heel – to – toe transition. I have put this shoe to the test on many long runs and I have never felt any pain while running. The cushioning was perfect and the heel – to – toe transition was smooth. The midsole material is made of LT Muscle which is a lightweight EVA cushioning compound that absorbs impact forces, it also has compressed EVA which runs the length of the shoe to provide underfoot cushioning. The upper on this shoe is made of a stretch air mesh which is breathable and offers a comfortable fit. Another thing new on this shoe is the Sensiflex window which allows the foot to expand in a controlled manner, which increases foot hold and reduces the chances of bunions. A signature feature to the Salomon shoes is the Sensifit overlays which wrap the foot for a snug and precise fit. Another feature on this shoe which makes the Salomon shine above all others is the lace pocket which holds the quicklace out of the way while running. The quicklace is made from durable Kevlar fibers which provides easy shoe entry and exit and a secure fit. The gusseted tongue keeps debris from the shoe and the rubber toe cap keeps your toes safe from bruising on rough trails. This shoe weighs in at 11.5 oz, its not the lightest shoe but for the price and the features it is pretty good. The heel is 25m and the forefoot is 15, overall it is a 10m heel to drop compared to most shoes which is at 12m. So if you are looking for a training shoe that will get you through the miles in comfort then this is the shoe for you!